I think it's a tradition that if you're a journalist, or even an obscure blogger like me, you do some sort of "predictions" post about this time of year. Not many people go back and grade themselves a year later and see how good they were at prognosticating the future. So, rather than offer up a handful of new predictions, I thought I'd go back and see how well I did on the last batch. Can't get better unless you know how you're doing, right? As with most marketing functions, EMC spends a lot of time and effort to get our name out there. But in this crazy YouTube world, sometimes marketing just happens. Disclaimer: I don't know who these people are, or why they'd ever want to do a semi-serious video about EMC. I've asked around, and no one seems to know how this happened, either. But, if you follow EMC regularly, you'll find it pretty clever ... watch it here. Don't know if you've ever taken a car trip through the Rocky Mountains (Colorado, Wyoming, et. al.) but if you stop in a friendly diner, you're likely to see a picture of a "jackalope" -- a monstrous cross between a jackrabbit and an antelope. The locals will tell you with a straight face how the nearby ranchers prefer them to horses since they run much faster and eat less. Of course, no such thing exists, but it's good fun. For some reason, there are those in the industry trying to make a connection between an extremely hot topic (server/desktop virtualization) and less-popular topics (storage virtualization, dedupe, thin provisioning, etc.). 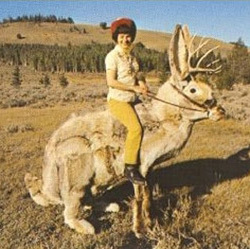 Just like the infamous jackalope, the possibility is plausible to tourists, but somewhat of an inside joke to the locals. Certain vendor-driven concepts in this industry can sometimes drive me nuts. Not because a certain concept might be less-than-relevant, but because some vendor (and analyst) concepts can actually lead you down an uncertain path where you'd be unhappy with the outcome. Today, I want to decipher the concept of "application optimized storage" -- the idea that if you've got Application X, it's best if you use Storage Y. This, I believe, is oversimplification to the point of potential harm, at least to many people. And I'd like to find a way to get our authoritative voices in the industry to take a slightly more sophisticated view of the situation. You might have seen EMC's announcement of Invista 2.0. I thought this topic deserved a bit of context. Storage virtualization has turned out to be one of those long-simmering topics in this industry. And it's still going to simmer for a while, I'd predict. This game isn't anywhere near from being over yet. Best as I can recollect, although the industry was talking about at the end of the 1990s, the discussion got very hot at EMC in the 2002-2003 timeframe. We knew that this was going to be an important storage technology, but we had some hard choices to make. If anything, one of the things I like about working for EMC is that we study the problem, and are willing to make the hard choices -- and stick with them -- to get to where we want to be with our customers. And with the recent announcement of Invista 2.0, I think it's a good time to reflect on the journey, where EMC and the industry has ended up, and maybe a bit of what happens from here. I used to comment a lot on the strange behaviors of others in our industry. I received some good coaching that I should do this infrequently -- if at all -- so I have been endeavoring to work in this direction. However, the craziness hasn't abated -- nor has the commentary. As an example, read this recent breathless press release from IBM on their "leadership in the storage software market". And then go read Chris Preimesberger's of eWeek's most excellent disembowelment exercise. I had the pleasure of sitting next to Chris at a dinner event a while back. Not your ordinary journalist, I'd offer. I've found his other material very astute as well. He's a really interesting guy to talk to as well, if you ever get the privilege. 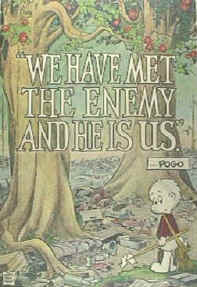 Walt Kelly's "Pogo" character uttered this famous quote, which found its way onto an Earth Day poster in 1970, or so web authorities say. A fitting quote in response to RSA's recent "person-on-the-street" view of everyday information security threats. Interesting reading to anyone taking the issue of information security seriously. The report basically shows that, while on one hand, everyone seems to know what's right and what's wrong with security policies, most everyone bends the rules (albeit well intentioned) on a fairly regular basis. Someone suggested that maybe I bump it up a level, and try to summarize and integrate some of the key trends that are making us all think really hard these days. You know, tie together the big threads and create a short, comprehensive picture. So, I'm going to give it a try -- let me know how I do? A New Category of Information? Not surprisingly, EMC is all about information infrastructure. A lot of our thinking involves thinking about different categories of information, the unique requirements of that information, and how we can build infrastructure solutions to help people store, protect, optimize and leverage all of it. In the past, we've made distinctions between, say, structured and unstructured information. Changing vs. static information. Managed vs. unmanaged. And so on. Our thinking is that by understanding differences, and you can come up with some pretty clever solutions -- simply by focusing on the information itself -- and what makes it different. And, I'd like to offer, maybe it's time for a new category of information. Every quarter, IDC and Gartner offer their views on who sold what where in the storage industry. If you're in this industry, you scrutinize the data like crazy, trying to figure out trends, relative positioning, etc. And, of course, there's the endless set of spin-releases from PR departments. So, let's take a look ... and no, this isn't me doing a round of chest-thumping for EMC.